Anthony Gottlieb’s landmark The Dream of Reason and its sequel challenge Bertrand Russell’s classic as the definitive history of Western philosophy. Western philosophy is now two and a half millennia old, but much of it came in just two staccato bursts, each lasting only about 150 years. In his landmark survey of Western philosophy from the Greeks to the Renaissance, The Dream of Reason, Anthony Gottlieb documented the first burst, which came in the Athens of Socrates, Plato, and Aristotle. Now, in his sequel, The Dream of Enlightenment, Gottlieb expertly navigates a second great explosion of thought, taking us to northern Europe in the wake of its wars of religion and the rise of Galilean science. In a relatively short period—from the early 1640s to the eve of the French Revolution—Descartes, Hobbes, Spinoza, Locke, Leibniz, and Hume all made their mark. The Dream of Enlightenment tells their story and that of the birth of modern philosophy. As Gottlieb explains, all these men were amateurs: none had much to do with any university. They tried to fathom the implications of the new science and of religious upheaval, which led them to question traditional teachings and attitudes. What does the advance of science entail for our understanding of ourselves and for our ideas of God? How should a government deal with religious diversity—and what, actually, is government for? Such questions remain our questions, which is why Descartes, Hobbes, and the others are still pondered today. Yet it is because we still want to hear them that we can easily get these philosophers wrong. It is tempting to think they speak our language and live in our world; but to understand them properly, we must step back into their shoes. Gottlieb puts readers in the minds of these frequently misinterpreted figures, elucidating the history of their times and the development of scientific ideas while engagingly explaining their arguments and assessing their legacy in lively prose. 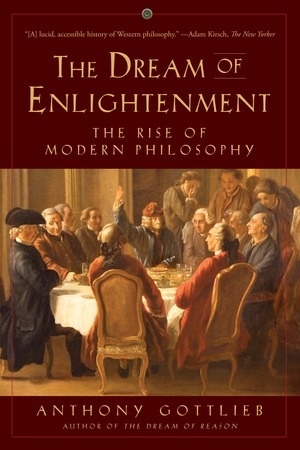 With chapters focusing on Descartes, Hobbes, Spinoza, Locke, Pierre Bayle, Leibniz, Hume, Rousseau, and Voltaire—and many walk-on parts—The Dream of Enlightenment creates a sweeping account of what the Enlightenment amounted to, and why we are still in its debt.